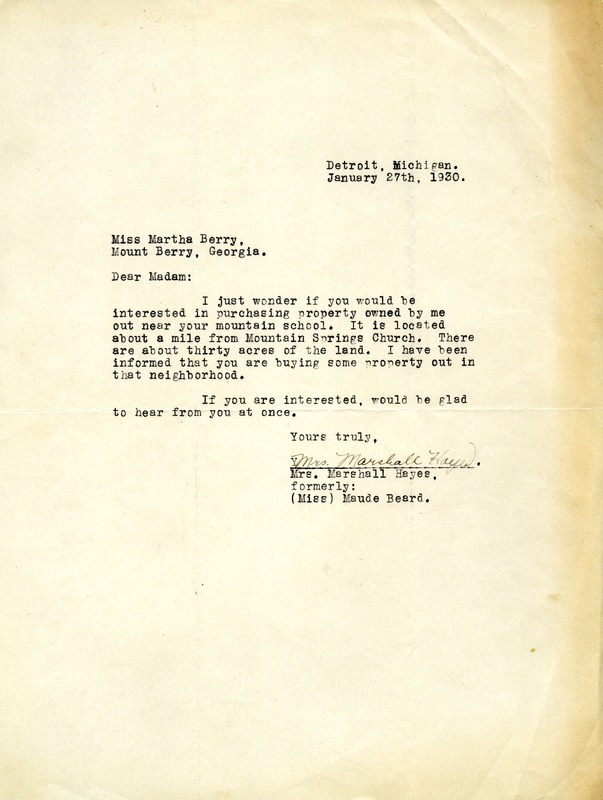 This letter is to Martha Berry referring to a possible property near her mountain school that she may like to buy. It tells her about the property and also asks her to contact her if she is interested in it. Mrs. Marshall Hayes, “Letter to Martha Berry from Mrs. Marshall Hayes.” Martha Berry Digital Archive. Eds. Schlitz, Stephanie A., Chelsea Risley, Alyssa Kenderdine, et al. Mount Berry: Berry College, 2013. accessed April 26, 2019, https://mbda.berry.edu/items/show/12800.